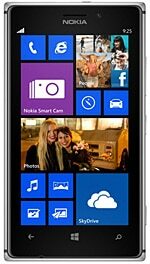 The Nokia Lumia 925 is an aluminium-bodied NFC smartphone that runs Windows Phone 8. The device has a 1.5GHz dual-core processor and a 4.5-inch 1280 by 768 pixel touchscreen. An 8.7MP camera features Nokia’s PureView technology and a Carl Zeiss lens, and can record 1080p HD video at 30 frames per second. The device has a similar specification to the Nokia Lumia 928, now available in the US, but without built-in wireless charging and with an LED flash in place of the US-bound unit’s xenon flash. The Lumia 925 also weighs 24g less, partly thanks to its aluminium shell. The Lumia 925 is available in Spain, Italy, Germany and the UK, priced at €469. Wider availability is expected in the future.